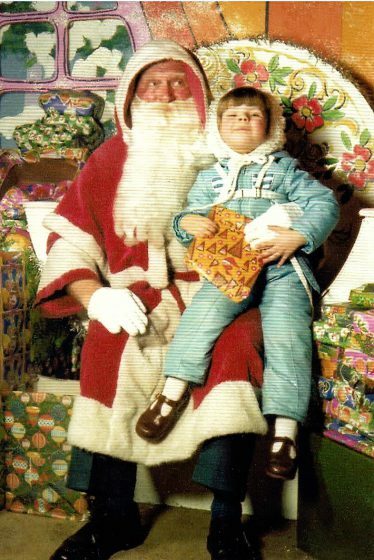 When I was a kid, going to see Father Christmas (because back then he really was just Father Christmas. I’m a bit more interchangeable with what we call him now. Father Christmas, Santa, I don’t really mind, Oscar knows they’re one and the same) was one of the highlights of my year. I can’t tell you how magical it was for me and that was due, in no small part, to the Father Christmas we used to go and see. If you grew up in or around Coventry in the late 70s/early 80s, I’m guessing you also went to see Father Christmas at the Co-Op, a department store in the city centre. I say that simply because I don’t remember ever going to see him anywhere else. And to be honest I never wanted to go anywhere else. I went with my mum and Nanna (and probably my brother although I don’t remember him being there) and it was almost more exciting than Christmas Day itself. Almost 😉 ! It was super special to me and thousands of others over the years, because you see they didn’t just have a Santa in a chair that you queued up to see, oh no! Before you went anywhere near a guy in a red velvet suit you had to get the sleigh to Lapland. Because you see we weren’t going to see any old Santa in a department store. No, we were travelling to Lapland to see the actual man himself. My memory of 35(ish) years ago, is some what hazy, but I clearly remember that the experience began with queuing up and being taken through a door into a room. The room was small and dark and lined with benches all facing a wall, in front of which where two (models) reindeer! Once everyone was seated, music and jingle bells would start, as would a projection of moving snow in front of the reindeer. It looked as though they were actually ‘dashing through the snow’. Suddenly we weren’t in just a room, we on a sleigh and we were off to see Father Christmas! My memory also wants to say that the seats moved, tilting as we dashed through the snow, but I honestly can’t see how that could have been and maybe I’m imagining it. Did it? The most jaw dropping bit of the whole experience for me, was when we ‘arrived. The ‘sleigh’ would stop and we would be shown out of the room, but, and this is the best bit, everything outside the room was different to when we came in. We were in Lapland. As a three and four year old that blew my tiny mind. It was the most exciting part of the whole deal. We had actually traveled to the North Pole! While I’m still not 100% sure how it was accomplished, I’m pretty sure now, that we were just taken out of a different door than we’d come in. But however they achieved it, at the time and for far too many years after I believed we’d actually traveled somewhere. It was truly magical. After all that seeing Father Christmas was just the icing on the cake. I sat on his lap and got my present wrapped in garish 70’s paper. I smiled for the photo. Seeing Father Christmas at the Co-Op, Coventry, circa 1981. Note the reins. Oscar truly is his mothers son! Also who knew Father Christmas wore grey suit trousers under his coat? Well I did eventually. The first year I was taken I was just one and having none of it. And quite right too. Now I have children I know how frightening that must have been to a one year old. 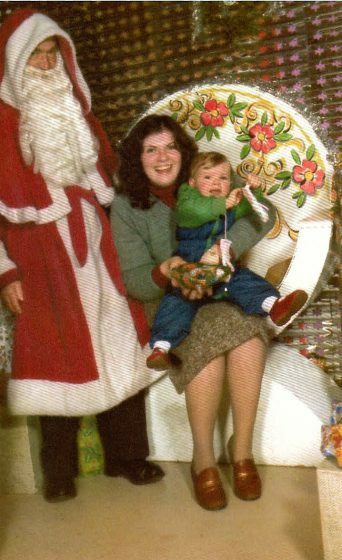 But it’s still gone down in family lore that I wouldn’t sit on Father Christmas’s lap the first time I met him and my mum had to sit in his chair with me instead. Because the whole seeing Santa thing can be overwhelming. The experience I had as a child was so sensorially exclusive. There’s no way I could ask Oscar to do any of what I enjoyed (eventually) as a child. Because we are/were very different children. We have in fact only taken Oscar to see Santa once in his life, when he was 5 months old and it really was more for us as parents than for him. 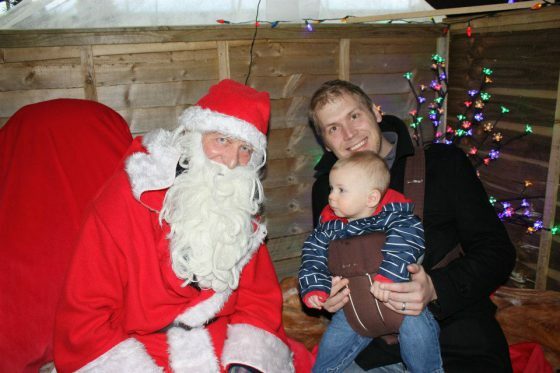 Oscar meets Santa in 2012. He wasn’t fooled by the beard. He tried to pull it off minutes after this! The following year he was already struggling with things such as waiting. And following his Autism diagnosis we stopped even considering putting him through an experience we were pretty sure he wouldn’t understand or appreciate and could cause him great anxiety. Like I said, very different children. However, as he grows, his capability and understanding grows with him. He’s much more aware this year of who Santa/Father Christmas is and this year for the first time in years we actually feel we want to give him the opportunity to see Santa; for him, rather than for us. It is true that some places are becoming more aware of inclusivity or even just providing a range of experiences to meet all needs when it comes to big events, such as Christmas. Last year I even read about some shopping centres (unfortunately not near us) running Autism friendly Santa grotto experiences, which is fab. All children should be given the opportunity to meet the big guy if they want to. However we have plumped for a very different kind of meeting all together this year, one that hopefully speaks to Oscar’s interests and needs. Following our fabulous day out on the Watercress Line in the summer we have decided to take him on the Santa Special where you “travel in a festive traditional train carriage, while Santa and his jolly helpers visit you in your seat with a special gift.” I have high hopes for this as it combines two of Oscar’s favourite things in the world; trains and receiving presents! It also removes any need to queue, something Oscar finds so hard to do. It also gives us our own space and we can take toys and snacks to help him if needs be. I honestly can’t wait. But wait I will have to, because I’ve booked it for Christmas Eve. This may sound bonkers to some of you, but Oscar struggles with the concept of time. My concern was if we saw Santa too soon, he might want his presents NOW, and not cope with having to wait weeks to get them. I could be wrong of course, but that’s AutismMamas for you. Always trying to second guess, always two steps ahead! Anyway, Christmas Eve it is. Who knows it might work out perfectly and bingo, we’ll have ourselves a new Christmas tradition. I mean it’s not as amazing as actually travelling to Lapland, like I did. But I think it could still be pretty magical 😉 .